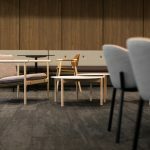 IA Design was engaged to deliver a show suite fitout within level 2, 45 St Georges Terrace with the goal to revitalise the tenancy in order to appeal to potential tenants. The project extended from show suite works to a basic upgrade of the toilets and refurbishment of the kitchen. The key driver was to provide a connection between work and breakout spaces, enticing incoming tenants with a fresh contemporary space. The design team delivered a full floor ‘plug and play’ office solution featuring a complete range of perceived workplace requirements to ensure the final product is visually high impact and functionally suited to use. The fitout is modern and inviting, opening the leasing opportunity to a wider market including younger businesses.